Creativity and science join forces in this kit that lets kids build their own light-up unicorn horn. In medieval times, brave adventures sought the elusive unicorn, believing its horn contained great magic. No one ever caught one. 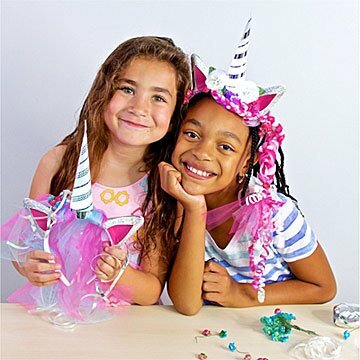 Natasha Dzurny figured out a better plan to harness enchantment: this STEAM-inspired craft kit that lets kids build their own light-up unicorn horn. Each DIY headband comes with holographic paper, stickers, and the electrical components needed to learn simple circuitry. It's a whimsical way to show kids that when creativity and science join forces, anything is possible. Made in New York.